The post How to Get Your Dog Into a Halloween Costume by Sassafras Lowrey appeared first on Dogster. Copying over entire articles infringes on copyright laws. You may not be aware of it, but all of these articles were assigned, contracted and paid for, so they aren’t considered public domain. However, we appreciate that you like the article and would love it if you continued sharing just the first paragraph of an article, then linking out to the rest of the piece on Dogster.com. I’m a huge lover of holidays, and I especially love finding ways to enjoy the holidays with our dogs. To me, finding a Halloween costume that won’t stress my dogs out is the most important thing about costumes. When we incorporate our dogs into holiday plans, I want to make sure that they’re enjoying the festivities, not anxious or uncomfortable in order for people to get a laugh. One Halloween, we took our dogs to the park in the afternoon. There were holiday festivities happening, and lots of kids in costumes. It was surprising how excited everyone was (adults and kids alike) to see our dogs all dressed up, and the number of positive comments we got. We go to the park multiple times per week and there are usually at least a couple of people who are nervous or uncomfortable around our dogs. Not while they were all dressed up! Everyone thought that they were pretty precious; I know part of that was that the dogs were happy and unfazed by their Halloween costumes. 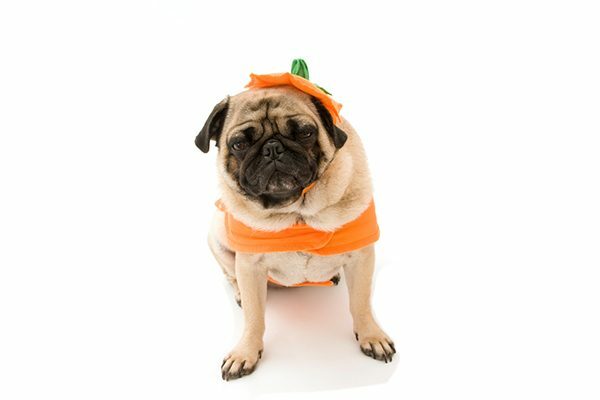 A pug in a pumpkin Halloween costume. Photography © dosecreative | Thinkstock. Find or make a costume that properly fits your dog and doesn’t restrict movement. Once you select a costume that you think is cute and funny and ensure it’s the right size, you’ll be on your way to a fun Halloween with your dog. Teaching your dog to be comfortable with being touched all over his body is a great all-around part of training. It helps you to identify if there’s anything wrong, like a medical condition, or to help your dog if he is injured. Dogs who are familiar and comfortable with being touched are more likely to smoothly adjust to wearing costumes. 3. Provide treats for tricks! Have lots of high-value treats on hand when you are starting to familiarize your dog with his costume. With a dog that is unfamiliar with dressing up, I like to start slow, treating (and clicking!) for any interest in the costumes, and then for allowing it to be put on. Throwing a costume on a dog who has never worn one will likely end up with you both being frustrated and stressed. Like anything else, you need to start slow. Use lots of treats and work up to Fido being able to keep the costume on all night long. Make sure the costume you choose doesn’t restrict movement and doesn’t pose any danger towards your dog. At one costume contest I attended, the the MC had to stop the festivities to tell a guardian that her dog’s leg was caught in the part of a costume! Yikes! About the author: Sassafras Lowrey is a dog-obsessed author based in Brooklyn. She is the winner of the 2013 Berzon Emerging Writer Award from the Lambda Literary Foundation, and the editor of two anthologies and one novel. Sassafras is a Certified Trick Dog Instructor, and she assists with dog agility classes. She lives with her partner, two dogs of dramatically different sizes, and two bossy cats. She is always on the lookout for adventures with her canine pack. Learn more at her website.